On recommendation from the Bailli and the Bailliage Committee, a Blazon (i.e., large plaque) may be awarded to a professional member who is the owner or executive chef of a dining establishment that maintains a superb level of cuisine, service and hospitality, as required by the exacting standards of Chaîne des Rôtisseurs internationally. It is essential that the establishment’s support services and facilities must be excellent too. It must own a grill or a revolving spit, and grilled or roasted meat must be available on the menu. The Blazon can be displayed outside or within the establishment. Since it is offered only to the finest restaurateurs and hoteliers, the Blazon proclaims excellence in food and service. However, the plaque remains the exclusive property of Chaîne des Rôtisseurs, and the privilege of using it is limited to those who continue membership and their high standards, and can be displayed only as long as the member remains in good standing. A blazon holder is allowed to feature the Chaîne logo on menus, brochures, press releases, personnel uniforms and on the cutlery, glassware and crockery as long as it is accompanied by the member’s name, Chaîne title, and the legend “Confrérie de la Chaîne des Rôtisseurs.” Should the blazon-holding Maître leave the establishment, resign, or be removed, then he/she agrees to surrender the plaque to the Bailli within eight days following his/her departure. 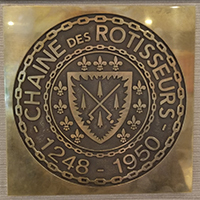 When Chaîne des Rôtisseurs was re-established in Paris in 1950, two of the five founding members were professionals, a rôtisseur and a grillardin. They were soon joined by restaurateurs, hoteliers, caterers, food and wine producers, and others. About a quarter of the world-wide Chaîne membership today continues to be made up of professionals. The experience, guidance and interest of our professionals has brought our Confrérie to its present respected place in the world of gastronomy.